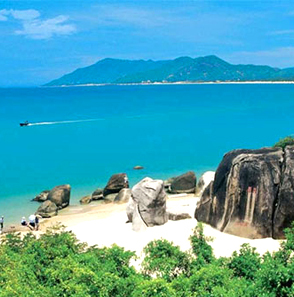 Sanya is the southernmost city in China. It's either an international shore tourist city, or an important foreign trade port in Hainan province. Living by the sea, playing seawater, eating seafood, all of these show the feature of this shore tourist city to the full. 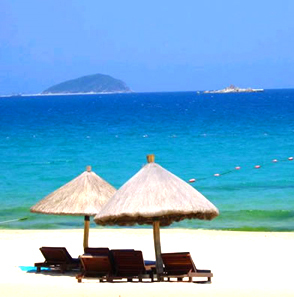 White beach, clear seawater, colorful underwater world, make Sanya into the best place for sunbathe, diving, sailing and beach sports etc. Sanya has been transformed from a spot that no one wanted to visit at the 'end of the world', to become one of China's most popular, most beautiful and relaxed areas. Sanya town is situated on a small peninsula, connected to the mainland by two bridges. The town itself is a noisy and atmospheric place. This is an active naval base and men in uniform, 'ladies of the night' and fishermen all mingle together around the docks and wharf area. This is a great place to soak up some atmosphere and the night market here is especially lively with seafood thrown on the streets, stores selling all types of weird and wonderful wares (including smuggled goods from Vietnam) and huge tea warehouses, all adding to the chaotic feeling about this place. And it is the beaches that are the biggest attraction here. 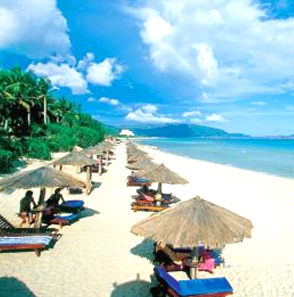 Sanya has some of the most beautiful and well-maintained stretches of sand not just in China but in southern Asia. The sand here is white, palm trees provide shelter from the sun and the sea is wonderfully blue and warm. This is just about the only place in China with a really laid-back feeling and atmosphere. You could spend anything from a few days to a week or so here, soaking up the sun, relaxing and just enjoying the unique and relaxed ambience that dominates this place. On arrival, you will be met and transfer to hotel, Free time on your own. Free day on your own, no guide and transfer service. You will be transfer to airport for back, service end. Approx airfare: it depends on the time of confirming the booking!!! Maybe less or more than below rate.